'He dances the same way, bashes up villains the same way, woos the heroine the same way and says his dialogues the same way,' notes A Ganesh Nadar. Vijay's last movie release Mersal became a hit because the BJP protested against it. He should have stuck to that winning formula. The message of the film is benami voting, which is casting someone else's vote. Vijay's Sundar is the highest paid CEO in the world, with a salary of Rs 1,800 crores. We are not told if that's in rupees or dollars, or if that is a monthly or yearly figure. The main villain (Radha Ravi) plays second fiddle to the chief minister -- his name is Two! 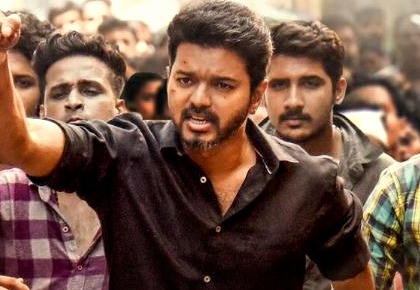 I doubt even the director A R Murugadoss believes half the things that happen in the movie, so I am sure he doesn't expect us to believe it too. 'What did you do after that?' asks the shocked hero. 'Lots of people had shot videos and they sent it to me on WhatsApp. I forwarded it other people, and we keep forwarding till another topic catches our eye,' the driver says. 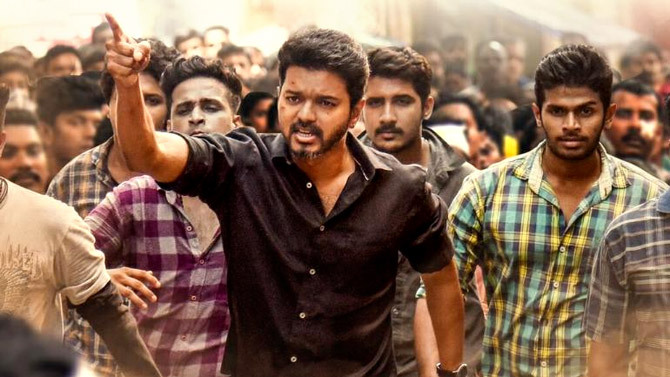 Other events like the Jallikattu protests , the Sri Lankan navy firing on Tamil Nadu fishermen, the 13 deaths in the anti-Sterlite firing all make their way to the film's dialogues. It's hard to believe that A R Rahman is the music director; all we hear is noise. Then, the fans start yelling and you realise that it's them filling up the theatres.